VICTORIA- Last August was an upsetting time for fourth-year Vikes men’s soccer player Isaac Koch. 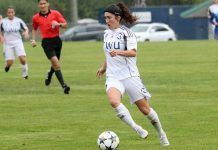 While playing soccer just a few weeks before the start of the 2018 Canada West season, Koch suffered a knee injury that sidelined him from the season. In spite of this adversity, the Kelowna native continues to stride forward by supporting his team off the pitch and doing everything in his power to get ready for the next season. After an outstanding opening three seasons of his university career Koch was recognized as a Canada West First Team All-Star in 2017, Koch found himself left off of head coach Bruce Wilson‘s 2018 line up. This knee injury was not the first for Koch who experienced a similar but less significant injury a few years prior. Koch expressed that his biggest struggle with the injury was having to watch his team play without him. Despite having gone through the extensive rehabilitation process, Koch remains positive and is working his way back to once again be a top performer for the Vikes in 2019. In addition, Koch demonstrates his love for his team given that he shows up to every practice even under his circumstances. Koch was cleared to run just recently and is gearing up to get ready for the next season. Koch grew up in West Kelowna, BC, where he began playing soccer at the age of four. “My parents tossed me in just like other young kids and I just loved it,” remarked Koch. 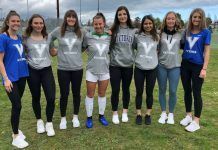 He decided to play for the University of Victoria after having an exclusive try-out with Vikes varsity head coach and nine time Canada West Coach of the Year, Bruce Wilson. Koch’s substantial involvement with the school and other organizations displays his selfless character. When he’s not busy attending class or practices, Koch volunteers with Special Olympics, where he gets kids with different special needs and abilities to get involved with sport. He also volunteers with the kids at his church, works as an event staff for other varsity Vikes events and is also a member of the Vikes varsity council. Koch described his current participation in the team as motivating and is grateful for all the support he’s received from his teammates. Wilson describes Koch as an exceptional leader who adds significant value to the team. Wilson recognizes Koch’s ‘hands-on’ personality and is looking forward to building on Koch’s remarkable leadership skills. Koch’s off field personality, dedication to the men’s soccer team as well as his involvement with the Vikes Athletics and Recreation department was recognized as he was named as a nominee for the 2019 Chancellor’s Award. According to Koch’s doctor and physiotherapist, the injury is healing quite well and Koch will be cleared to take to the field shortly. Wilson, who captained the Canadian team at the 1986 FIFA World Cup and led Canada to the quarter-finals of the 1984 Los Angeles Olympic Summer Games, has full belief that Koch has the talent to pursue a professional career after his time with the Vikes. Koch and the Vikes will begin their Canada West campaign at the end of August 2019.